Inspired by the country, designed for modern life. Really Wild clothing is a luxury British lifestyle brand. Since 2002, we have been creating bespoke clothing for the city and the country. Our collections are as practical and comfortable, as they are elegant and timeless. Really Wild’s ethos is deeply rooted in the rich heritage of the countryside and its traditions. We work closely with our experts across Britain and Europe, from traditional mills in Scotland and Italy, to our long-established bootmaker in the rolling Spanish hillside. We do not mass produce, but instead create limited edition runs. Every inch of our designs is curated by our founder and designer, Natalie lake. Our bespoke fabrics, colour and attention to detail, is paramount in creating beautiful tailoring for women who move confidently between busy city life and country pursuits. 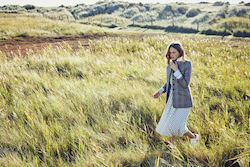 Liberty silk prints, tailored tweeds and our iconic Spanish boots: we understand how to bring together flattering feminine silhouettes with warming weaves, combining colours and yarns to create a wardrobe that is exquisitely crafted, endlessly versatile and forever stylish. Really Wild are pleased to offer members 10% off your first order. Shop online and receive your discount, using the code Discover10 at the checkout.